A combination of Chinese herbs and medicinal mushrooms strongly replenishes Qi, vitality and natural defences of our organism. MycoBalance has two directions of action. Firstly, it encourages the creation of Qi and blood, for example, it strengthens our organism, replenishes both energy and mass, which it needs for its proper functioning. Secondly, according to Chinese medicine, it significantly stimulates Wei Qi (our defensive system), which is then able to defend the organism better against external invaders and cleans it from the invaders, who have already invaded. It contains the following mushrooms: Reishi (Ganoderma lucidum, lingzhi mushroom), Cordyceps (Cordyceps sinensis, caterpillar fungus), Shiitake (Lentinula edodes, oyster mushroom) and Enoki (Flammulina velutipes, lily mushroom). 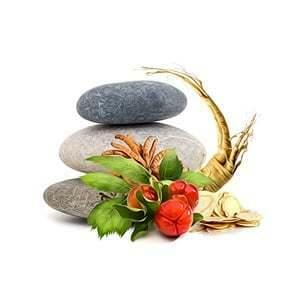 It contains the following herbs: Ren Shen (Panax ginseng, ginseng), Huang Qi (Astragalus membranaceus, Astragalus), Dang Gui (Angelica sinsis, donq quai or female ginseng), Da Zao (Ziziphus jujuba, jujuba) a Acerola (Malphighia glabra, Barbados cherry). The best of Chinese medicines to strengthen both Qi and blood. the mixture is used for weakness of the defensive Qi, which allows frequent attacks by external harmful substances. According to Western studies, MycoBalance boosts natural defences, the normal functions of the circulatory system and maintains normal blood cholesterol levels . Thanks to the herbs used, it’s a powerful adaptogen and therefore, it helps our body adapt to the environment. It also has antioxidant ability, it harmonises blood pressure, maintains normal blood sugar levels, maintains normal functions of kidneys and urinary bladder. It also supports mobility of joints. We can also use it for reproductive problems, because it promotes mobility of sperm. It also helps maintain premenstrual and menopausal comfort. In women, it helps to maintain the normal functioning of the urogenital system. It’s also suitable for athletes, as it supports transport of oxygen in blood. Fatigue states and weakened immune system have many common causes: we work hard, we are under constant psychological pressure, we eat poor food, the composition of our diet doesn’t correspond to the state of our organism or we eat irregularly. According to Chinese medicine, all this exhausts Qi and blood, the fuel of our organism.